OK, the article about MIB at the coal research facility near Pittsburgh reminded me of an encounter (not to me but friends) that is somewhat sketchy at this point in my life and happened as a teenager (about 16 - I'm 58 now). Some friends were Mud-Bogging their jeeps on trails around a wooded/forested location in southwestern PA, Fayette County, that was some sort of mine research facility at that time. It was located at the base of the mountains where there were massive limestone mines. As a side note, these mines can be 30-50 feet high and as wide into the mountain possibly for a mile. They can fit the largest of earthmovers. The area is now a quarry where stone is crushed and can be purchased. You can see it at Lat 39°44'15"/ Lon 79-45-16. I dont know if the site was fenced or how they got in. (Probably not as developed at that time as shown on Google and may not have happened at that exact spot). Anyway, the story goes that my friends were confronted by ARMED military personnel in an armored Jeep and escorted out. That's about all I know. I also remember talk about large covered tractor trailers entering the site at that time at night. 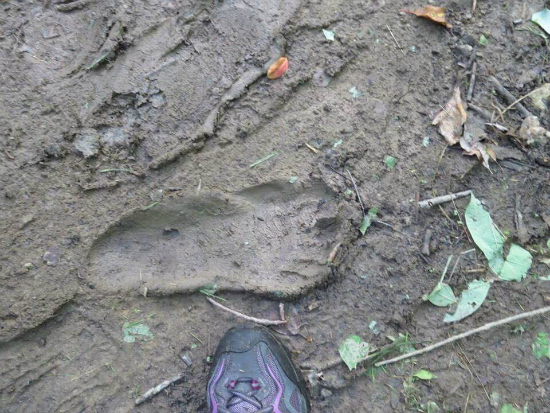 Coincidentally, while building the wind turbines on this mountain within the last 10 years, there were Bigfoot sightings by the construction personnel. 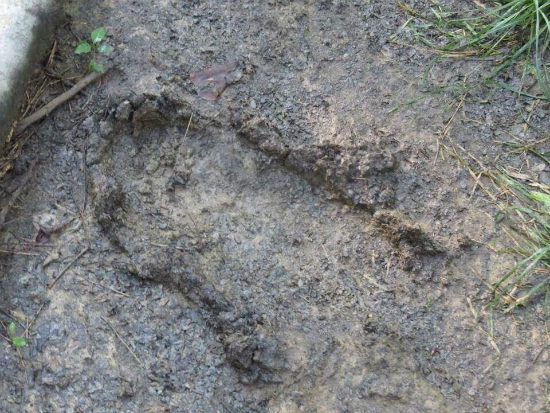 "Took photos of these prints on Kentuck Trail from the Kentuck Campground area towards Thorb Knob. 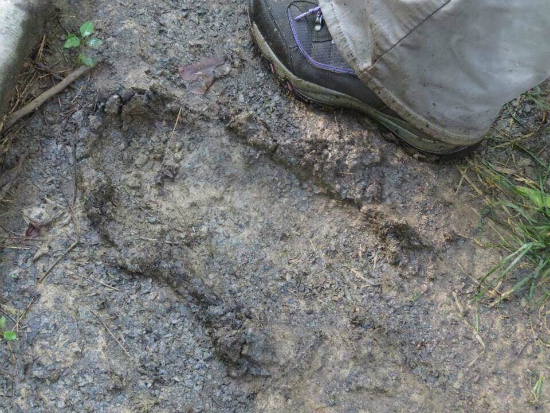 These prints were crossing the path in the oppisite direction and way out on the trail, not close to the campground or Thorp Knob. Took these in July 2017. 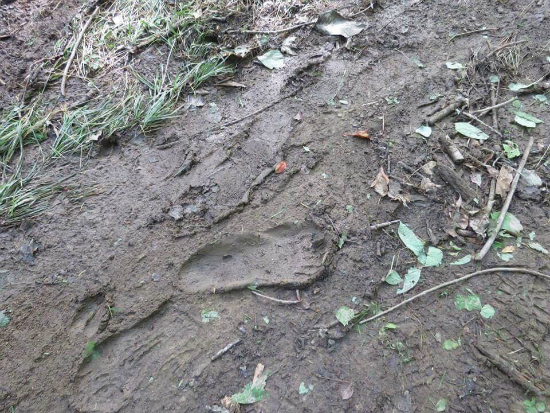 The older tracks were found on Old Mitchell Place Trail in August 2017. No measurements or casting taken"
This past August of 2017, I was sitting with a few friends (all of us are between 45 and 55 yrs old) on the beach in Long Beach NY, situated between two large jetties approximately 500 yards apart. More specifically, between the Franklin Avenue and Lincoln Avenue beach entrance ramps. It was a perfect sunny day about 3pm or so. The tide was relatively low, so our position put us a few yards above sea level and you could look down a few degrees over the water. As I stared out over the water, I suddenly saw a mist in the air just above the water, moving about 20 or 25 mph, from west to east, emanating from what seemed to be a wire or antennae from a submerged object. It moved straight across the beach about 100 feet out, and was way too fast to be any marine life. We see a lot of dolphins and whales in the area, which wriggle or bob as a mammal would, and certainly aren't very fast. This thing moved dead straight and super fast, about the speed of a wave runner at half throttle. The water mist that trailed it came in so fast I didn't even have time to mention it to my friends. I was thinking "what the hell is that??" It then did a 45' angle turn towards open water as it moved directly in front of me, and because of the angle above the water where we were situated, I could see the outline or shadow of the object in the water, and it was about 20 feet long (maybe longer) and shaped perhaps like a missile or long cylindrical object. It accelerated as it went further out, yet I could still see the dark shape as it headed for open water, the mist of the antennae breaking the surface the whole time. The entire episode lasted maybe 10 or 15 seconds. Weird!! I would definitely classify this as a USO (unidentifiable submerged object) and can only imagine what the hell it was doing there....observing human life along the shore? Recon? Tired: multi-rotor copters and fixed-wing drones. Wired: flying robots that move like living animals, are crafted of next-generation materials, and draw their power not from batteries but energy beamed from nearby aircraft. On Wednesday, the the Defense Enterprise Science Initiative, or DESI, announced a competition for basic science grants to build “new paradigms for autonomous flight, with a focus on highly-maneuverable platforms and algorithms for flight control and decision making.” An accompanying Broad Agency Announcement gets more specific: basically, they’re looking for bat-like drones that can be powered with directed-energy beams. A free Kindle edition of Phantoms & Monsters: Bizarre Encounters will be available for download on Saturday January 6th through Monday January 8th - just a small 'thanks' for your continued support!